Birders. I’ve had the pleasure of being on a number of pelagic trips this year and I can tell you…ya’ll have a lot of work to do. Nowhere is bird misidentification more rampant than on pelagic trips. Some of them are quite novel…which is fine. Pelagic birding is often unpleasant and frustrating. If someone confuses a Scripps’s Murrelet (above) for a Common Murre and not a Craveri’s Murrelet (the proper misidentification, in this case), it’s not the end of the world. A lesser birder would tell you to just go pick up Steve Howell’s tubenose book or Sibley or National Geographic…but I can’t leave it at that. I am the greatest birder, as I’m sure you have heard. I cannot let my flock wallow in the grips of seabird misidentification for long…the consequences could be dire. So if you are planning on being on one of the many California/Oregon/Washington pelagic trips that have yet to run this fall, here are some tips that could help prevent brainfreeze when an unfamiliar bird meets your gaze. Let’s start with jaegers. All three species are in California waters right now. Sure if they have their fancy central retrices grown in they are relatively easy to ID, but many of them don’t. Where to begin? Pomarine Jaeger is a good place to start. They are big and fat (or “deep-bellied”, as some birders say), by jaeger standards. Even their bills are heavier. Watch for the double white wing flash on the underwing. Long-tailed Jaeger can often be the easiest to ID of the three. They are small, thin, ternlike, and have completely dark underwings as second year birds and adults (above). Adults lack a breastband, although some Parasitics lack it as well. Long-taileds typically are found far offshore, so if you see a bird fly by the harbor on your way out to some distant underwater canyon, don’t be expecting it to be this bird. This is probably a bad photo to use for ID purposes…but jaegers are tough in the field, so why should they be easy here? A quick explanation of what is going on is in order, I suppose. 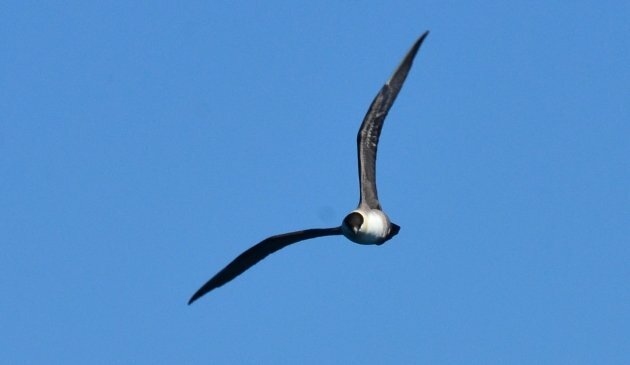 This Parastic Jaeger is upside down…the head is swiveled to be oriented correctly, but the bird is flying on its back, so to speak…the breast and belly are not visible. This is not a standard posture for aerial locomotion. Parasitic Jaeger is midway in size between Long-tailed and Pomarine, and can easily be confused for both. Unlike Long-tailed, adults and second year birds have substantially more white white in the upperwing. Most (not all) adults have some form of a breast band, which can be a quick way to tell them apart from Long-tailed if the telltale central retrices aren’t there. But what is the most important lesson for jaeger ID? Sometimes you just can’t give a bird a name, especially when it comes to having poor views of Pomarine/Parasitic. It’s a fact you will have to accept. 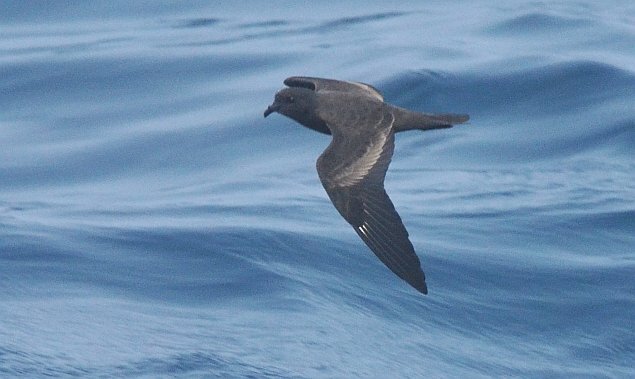 What do you need to know about storm-petrels? Memorize which species are dark-rumped and which are white-rumped. After that, just watch how the birds fly. Each species has a distinct flight style. With enough time spent doing this it becomes surprisingly easy to pick out the less common species, even with the naked eye. 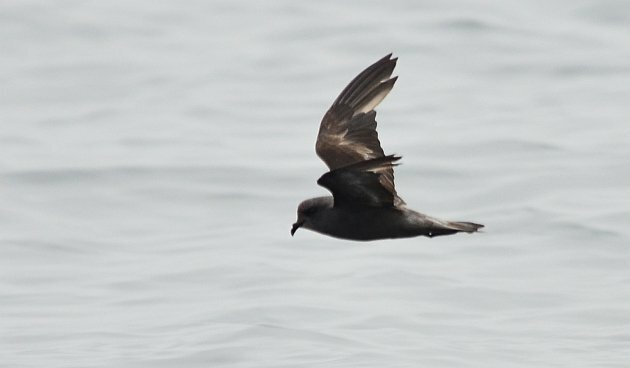 Black Storm-Petrel is present up and down the California coast right now; not only are they bigger, blacker and longer-winged than Ashy, they fly much with much slower and deeper wingbeats. Ashy Storm-Petrel is the most abundant storm-petrel in central California. Know them. Love them. They are practically endemic. They have much quicker wingbeats than Black and Least Storm-Petrels. 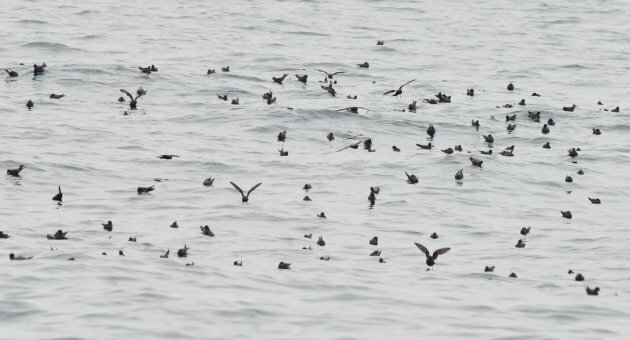 If you are lucky enough to encounter a raft of Ashy Storm-Petrels, it can be possible to pick out other species by size alone. Wilson’s Storm-Petrels, regular off central California in fall, will often flash their white rumps while sitting on the water. 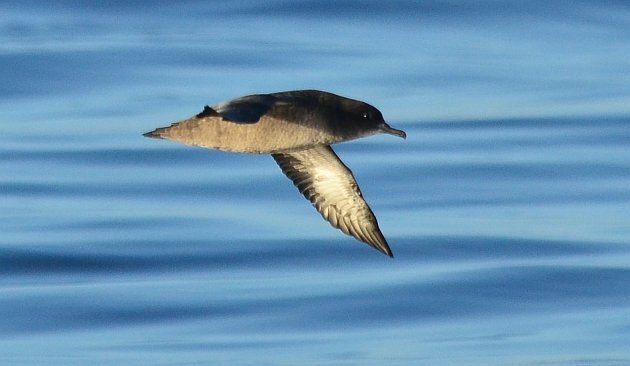 Much has been written of differentiating Sooty and Short-tailed Shearwaters. They can be extremely painful to separate. I just wanted to drop a couple of hints. Let’s take a look at this bird. It seems to have pretty dark wing linings, a nice mark for Short-tailed. How about the neck? Short-tailed is supposed to have a short neck…but does this bird even have a neck? Experienced observers will think that it actually does, and its relatively long…although this probably makes no sense to someone attempting to pick out their first Short-tailed. 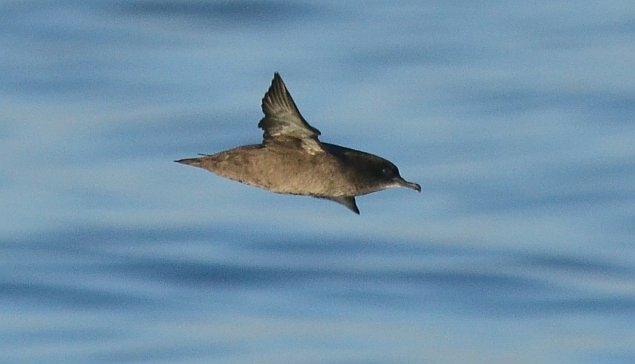 The forehead is certainly not very sloping, which one would expect for Sooty Shearwater. How about that bill? Looks pretty big, a better match for Sooty. But that chin! It’s white! A solid mark for Short-tailed, right? This is the same bird, photographed a couple seconds before the previous shot was taken. All of a sudden it has blazing bright wing linings, but for some reason the bill looks shorter. What am I trying to tell you? Trying to ID a particular Sooty/Short-tailed by chimping (especially using a single photo) can be very, very misleading. Lighting has everything to do with how the underwing pattern appears; the “true” pattern is best decided in the field, not a computer screen. Oh, and Sooty Shearwaters can have white chins, and they both have short tails. Of course, being able to pick up on flight style is important as well. 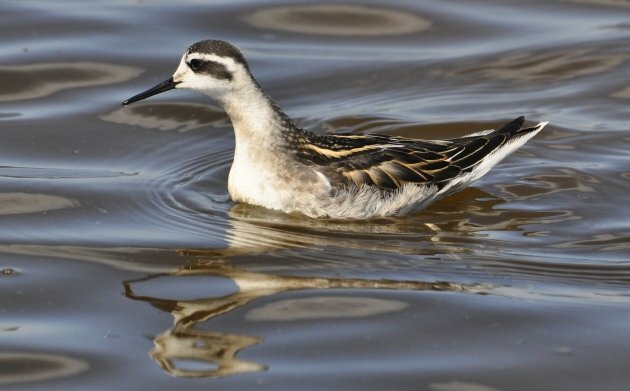 Red-necked Phalaropes are common at sea this time of year. Red and Red-necked Phalaropes often form mix flocks, but Red-necked often favor waters closer inshore, while Reds are more common further out. Many Red-necks this late in fall are juveniles (above), with dark caps and dark backs with yellow streaking. 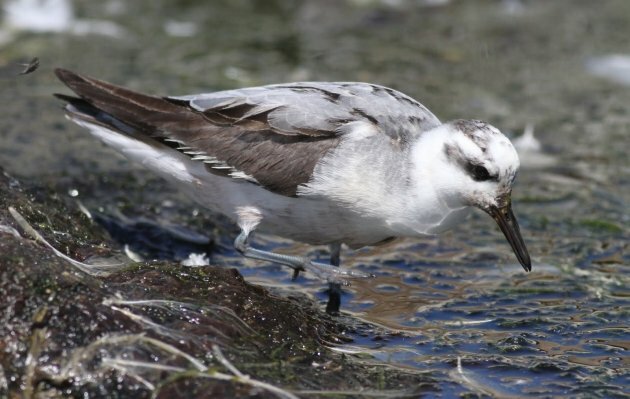 Red Phalarope is a bigger, bulkier bird. This is a molting bird, but shows the shorter and thicker bill, whiter cap, and light gray back. I get more questions about these birds on boat trips than anything else, but I’m not sure why…storm-petrels and jaegers are much more challenging. 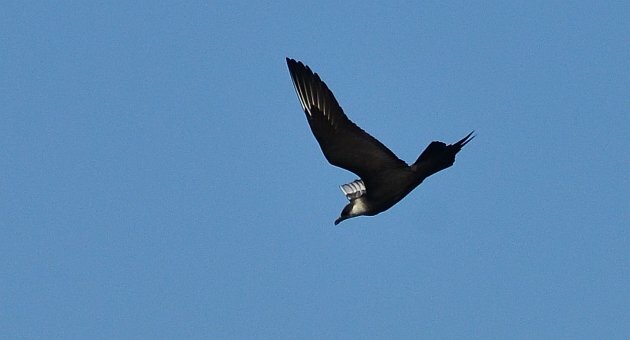 Oh…these are often misidentified as Fork-tailed Storm-Petrels in flight…the key is that phalaropes fly like phalaropes, and storm-petrels fly like storm-petrels. Not too bad, eh? Photo by Birdcrusher. There are many more problematic species over the North Pacific (arguably, all of them), but hopefully this will give you a head start. What is the best thing you can do before a boat trip? Study! That’s what bird books are for! Not everyone can be lucky enough to have the overlord ornithologist at their side. Otherwise, pay close attention to the flight style of everything when you’re out at sea…every species has its own way of flying, and it’s a great way to pick out different birds when there is too much fog and swell to see other details well. Thanks for a great post! I recently saw a few dozen Red-necked Phalaropes migrating through the Olympic Peninsula and loved watching their dancing (feeding?) behavior on the water. Your photo is the best I’ve seen of one close up! I hope you’ll do another post about identifying West Coast seabirds on the water, rather than in flight. I’m sincerely glad that you didn’t reduce me to a gibbering fool with albatross pictures. Also, that upside-down shot is just not right. Not right at all. @Corey: I have seen so many albatrosses that I can tell you they are totally overrated. Nothing but big gulls, essentially. And Felonious. 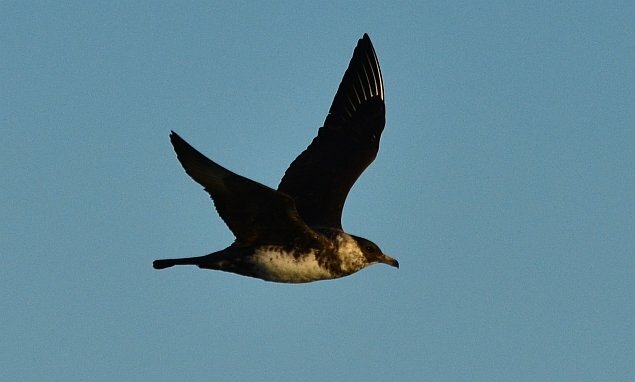 I am amazed what kind of post you crafted just so you could show us that unreal flight shot of a Parasitic Jaeger!